200 gm ‘easy cook’ long grain rice – rinsed in a sieve. 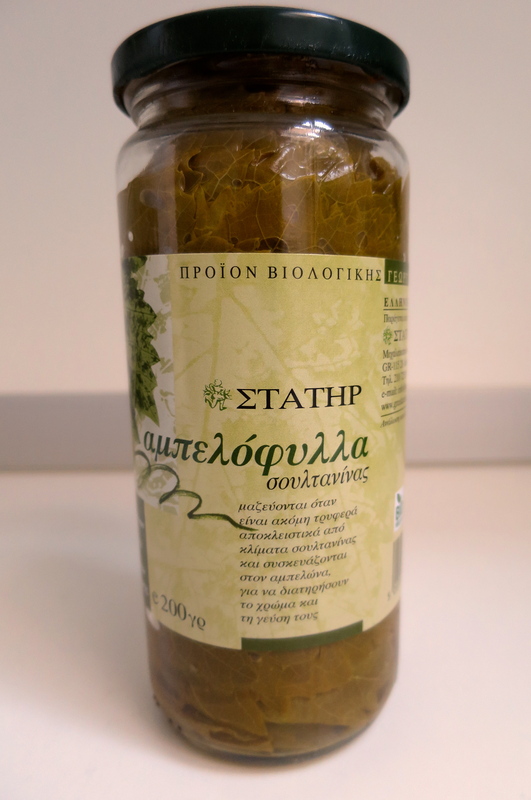 Carefully pull the tightly packed leaves from the jar – they will stand a fair good tugging! Discard the brine. Place them in a large bowl and fill the bowl with cold water. Separate the leaves as much as possible. Fill the bowl with water and empty it a couple of times to get rid of as much of the brine as you can and drain. Put the leaves on a tray or board and trickle over the lemon juice. Now prepare the ‘stuffing’. Put the minced beef into a medium sized bowl with the chopped herbs, rice, grated tomato, salt and pepper and the ‘Greek Chopped’ onion. To chop an onion the Greek way, you first peel the onion. Then take a slice across the top of it, exposing the rings. Now slash across the top in a criss-cross pattern. Then slice through the rings of the onion and you will find that the onion will come away in a fine dice. Mix all these ingredients together well with your hands and then add the olive oil and mix again. Take a good sized pan and grease the inside well with a quarter of the butter. 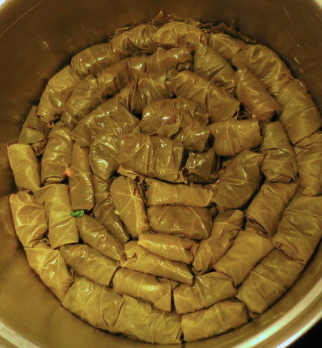 Now start to make the stuffed vine leaves. I am describing doing this as a right-handed person. Take a leaf and hold it flat in the palm of your left hand. You need to have the stalk side uppermost and with the base of the leaf towards your wrist. Place each of the bundles in the buttered pan. Make sure that they are very close to one another, as you don’t want them to move during the cooking. 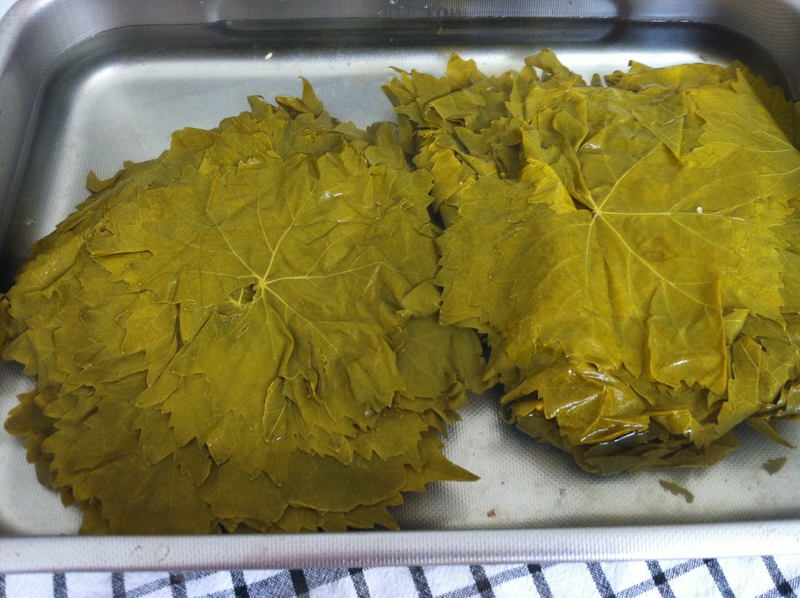 Carry on with this process, making another layer of bundles if necessary, until you have used up most of the leaves – keep a few of the mis-shaped or torn ones back, as you will need these to cover the top layer. Cover the last layer with leaves. 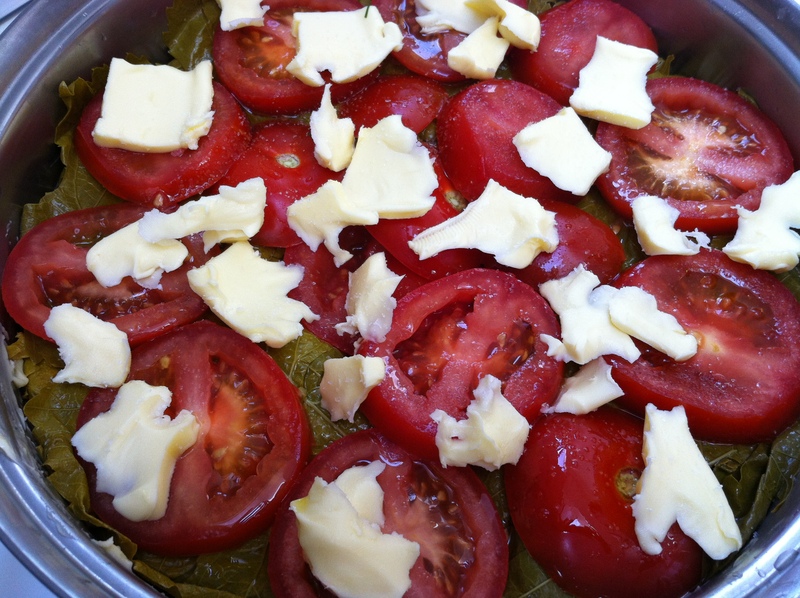 On top put the sliced tomatoes and dot with the remaining butter. Now slowly add a couple of cups of water, put an inverted plate on top, pressing it down slightly.The plate need to cover most of the contents of the pan. Add a little more water – it must not come above the plate though. Now put on the stove and cook slowly, ensuring that it does not boil dry, for about 35 – 40 minutes. After this time, carefully remove the plate – it will be very hot! 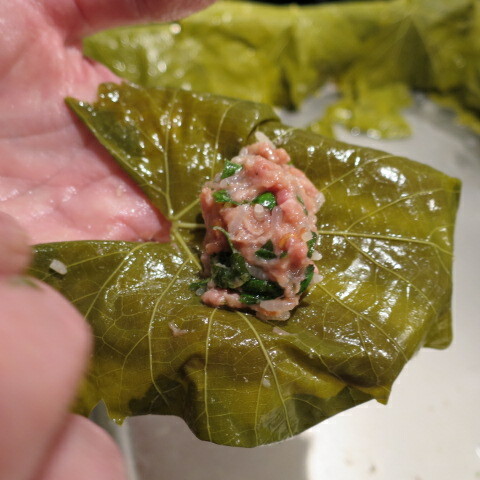 Gently uncover a part of the top layer of yaprákia, take one out and try it to see if the rice has cooked. If not, cover everything up again, add a little more water if required, and cook for a further 10 minutes or so, until cooked. Remove from the heat and allow to cool for a few minutes. 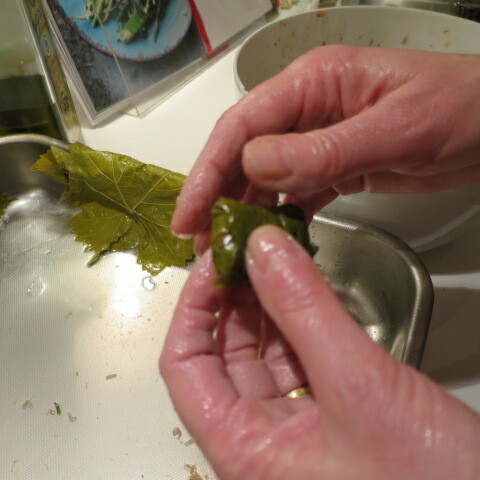 Remove the plate, tomatoes and covering leaves. Next make the egg and lemon (avgolémono) sauce. Beat the eggs together in a bowl, gradually adding the lemon juice. Next slowly add the hot juices from the pan, beating the egg and lemon mixture continuously. It is important to add as much of the hot liquid as possible – this will ensure that the mixture is at the right temperature and will stop the sauce from curdling. Pour the egg and lemon mixture over the yaprákia and give the pan a gentle shake, so that the sauce goes all over. Allow to stand for a few minutes so that the sauce sets. Carefully remove the yaprákia to a serving dish and serve. Note – Yaprákia (dolmadákia) can be served at room temperature as part of a mezé. If you are doing this, do not make the egg and lemon sauce. 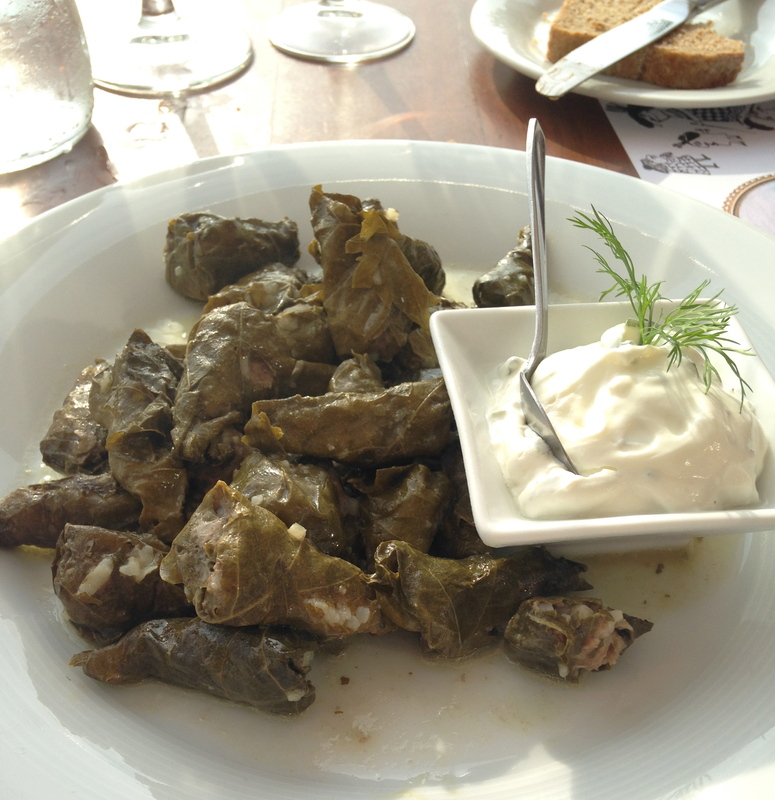 Instead, you can serve them with a little Greek yoghourt on the side, or on their own.